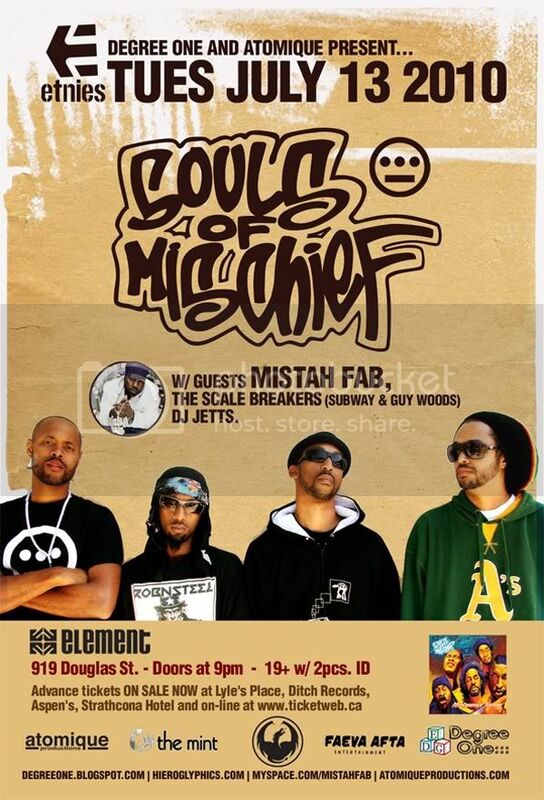 Degree One Events: SOULS OF MISCHIEF w/ MISTAH F.A.B. SOULS OF MISCHIEF w/ MISTAH F.A.B. Summer's heating up in Victoria and West Coast Legends, The Mighty Hieroglyphics Crew members are gonna make it even hotter. plus The Scale Breakers ( Subway & Guy Woods) and DJ Jetts. Souls of Mischief’s first LP, 93 'Til Infinity (Jive, 1993) debuted at #14 on Billboard's R&B charts, placing at 109 in the top 200. Their second album, No Man's Land (Jive, 1995) came in at #27 on the R&B charts. In 1995, Souls of Mischief members A-Plus, Opio, Phesto and Tajai joined forces with the other members of the Hieroglyphics crew including Del, Domino, Pep Love, and Casual to create a new independent label- Hieroglyphics Imperium- to publish and market the collective's, and individual members', releases. In 1998 Hieroglyphics released Third Eye Vision, their first album as a group. Souls of Mischief also released Focus in 1998, the first album on which they exercised complete creative and marketing control over their own material. In 2000 SOM followed up with the LP Trilogy: Conflict, Climax, Resolution. Hieroglyphics released their second group album, Full Circle, in 2003. In the midst of touring and recording, Souls of Mischief remained active as a group as the members released solo projects including Tajai’s Power Movement (2004), Opio’s Triangulation Station (2005), A-Plus’ My Last Good Deed (2007), and Opio’s Vulture’s Wisdom, Volume 1 (2008). Montezuma’s Revenge is a futuristic return to the vintage Souls of Mischief sound, with stellar production from A-Plus, Domino and Prince Paul (De La Soul, Gravediggaz, Handsome Boy Modeling School), who brings his unique comedic bent to the project. Even the most die-hard Hieroglyphics fan will agree after sampling Montezuma’s Revenge – it was worth the wait. One of the most prominent and colorful figures of the San Francisco Bay Area hyphy movement in the late 2000s -- sometimes hailed as the scene's "crown prince" -- North Oakland-based rapper Mistah F.A.B. presents a somewhat exceptional combination of street credibility, social consciousness, astute introspection, and irrepressible goofiness. Born Stanley P. Cox in 1982 and raised by his mother and grandmother, he stresses the positivity of hyphy's party-happy, irreverent, but inspirational "go dumb" mentality and manifests a dedication to inner-city social issues, which doesn't mean he's immune to a certain amount of mainstream rap's flamboyant materialism: his handle is supposedly an acronym for "Money Is Something to Always Have -- FaEva After Bread." F.A.B., who also goes by Fabby Davis, Jr., titled his second album Son of a Pimp in bluntly literal reference to his pimp father, who was incarcerated for much of F.A.B. 's childhood and died of AIDS-related complications when his son was 12, around the time he started writing rhymes. That album, F.A.B. 's first for hyphy forerunner Mac Dre's Thizz label (following his 2003 debut, Nig-Latin), featured collaborations with many noted Bay Area rappers including Dre, E-40, Turf Talk, and G-Stack of Oakland heroes the Delinquents -- as well as Kanye West -- and boasted one of the biggest hits of the resurgent hyphy scene, "Super Sic wit' It." In 2006, F.A.B. became the subject of a major-label bidding war, signing with Atlantic Records that September, but a series of obstacles hindered his career momentum. KMEL-FM, the Bay's top urban station, imposed an unofficial but crippling blacklist of F.A.B. 's songs and guest appearances, due to petty personal grievances as well as the perceived slight of his successful show on a rival station, thereby significantly undermining his hometown visibility. Later, his breakout single, "Ghost Ride It," was the subject of controversy on two fronts - national clamor over the hyphy practice of "ghost riding" described in the song (throwing a car in neutral, then jumping out and walking alongside or riding on the roof as it continues to move), and threatened legal action from Columbia Pictures over the use of the Ghostbusters logo in the video (the track samples the movie's theme song) - which caused the video to be first heavily censored and then pulled from TV altogether. As Victoria's foremost hip hop concert promoter heres a list of some of the performers I've had the great opportunity to work with.. Jurassic 5, Jedi Mind Tricks, Snoop Dogg, Ghostface Killah, KRS ONE, Swollen Members, Pharcyde, Ice Cube, M.O.P., Digital Underground, Andre Nickatina, Talib Kweli, Digable Planets, Rihanna, Ice T, Mr. Lif, De La Soul, DJ Honda, GZA/Genius, Hilltop Hoods, Abstract Rude, Del tha Funky Homosapien, B-Real, 2 Live Crew, Cage, Aceyalone, Mix Master Mike, Jeru, DJ Craze, Jazzy Jeff, Rahzel, Roc Raida (RIP), Fat Lip, Blackalicious, Kool Keith, The Coup, Hieroglyphics, Dres of Blacksheep, Living Legends, Black Eyed Peas, Afrika Bambaataa, Maestro, Casual, Funkdoobiest, Rascalz, Daz, Kurupt, Alkaholiks, WC, Mike Relm, Ray Keith, Soul Slinger, K-OS, Babu, Kardinal Offishall, A-Trak, Visionaries, Zion I, Rhettmatic, Jully Black, Masta Ace, Funkdoobiest, Z-Trip, DJ Food, Herbaliser, Busdriver, Saukrates, Scratch, Young Buck, Mr. Complex, Ugly Duckling, Buck 65, DJ Vadim, Arsonists, Classified, Kid Koala & Bullfrog Band, El Fudge, KutMasta Kurt, Cash Money, K-Naan, Beatnuts, Baby Blue Soundcrew, Peanut Butter Wolf, Souls of Mischief, Raekwon & MANY MORE.. Copyright Degrockski 2017. Simple theme. Powered by Blogger.